Internet is incomplete without Google. Google is one of the largest internet giants. It has a large number of popular services like Gmail, YouTube, maps and much more. The company’s biggest project Android is the most popular mobile OS in the world. It also has many apps like hangouts, allo, duo, etc. Google is very aggressive in software development as well. The company’s one of the best creation is the online office document services of Google docs, Google slides and Google sheets. This allows users to create, edit and share documents online simply in a browser without installing any software on your system. These services are completely free to use. Google slides is an MS PowerPoint alternative that lets users create slideshow presentations. With slides, you can create your presentations simply in your browser tab. It is very easy to use and all its features resemble MS PowerPoint. But what most users do not know is how to add music to Google slides presentation. So if you are unable to add music in Google slides, and are looking for a way to add music to a slide in Google slides presentation, then we have perfect solutions for you. Below we have listed complete steps on various methods on how to add background music to Google drive slides. How To Add Music To Google Slides. Method 1:- Add URL Of A Music File. Method 2:- Add Music From YouTube. Method 3:- Upload .mp3 File To Google Drive. Step 1. Open the Google Slides presentation in your web browser and then go the slide to which you want to add music. Step 2. Click on Insert, and then Text box from the menu or click the text box button in the toolbar. Click on the slide to automatically create a text box. Step 3. From your favorite online music service, find the track you want to use in your presentation, and click share to get the link to the file. Step 4. Return to your slide and paste the track link into the text box you just created. Step 5. Resize the text box according to the need of your slide. Step 6. Play your presentation and click the link to trigger the music. The file will open in separate browser tab and play until you close it. You can even cover the link behind an image to look nice. You can even add music to google slides presentation from YouTube. Just follow the steps given below. Step 1. From the slide on which you want to add music, select Insert > Video from the menu. Step 2. Type your query in the YouTube search field that pops up. Step 3. Click the video with the music you want, and hit Select to place it on the slide. Step 4. Click the arrow tool and resize the video to its smallest size, and position it where you want it on the slide. If you have an mp3 file locally stored on your system that you want to add to your Google slides presentation, Follow the steps given below. Step 1. Upload the .mp3 file to your google drive. Step 2. 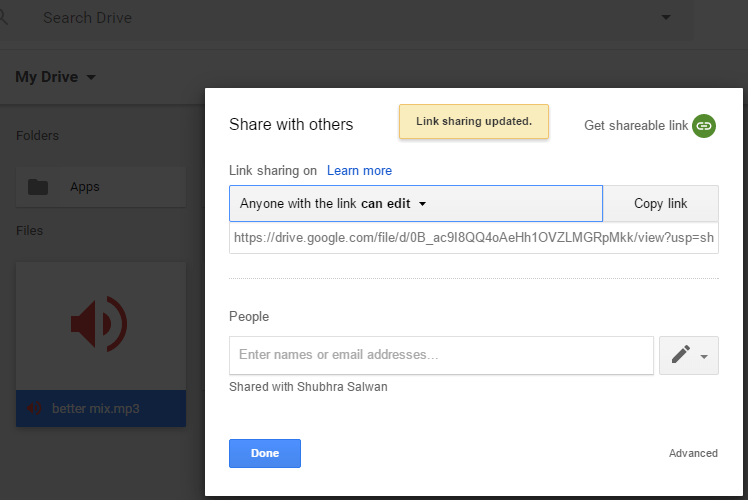 Set the file to public and copy it’s shareable link. Step 3. Open the Google Slides presentation in your web browser and then go the slide to which you want to add music. Step 4. Click on Insert, and then Text box from the menu or click the text box button in the toolbar. Click on the slide to automatically create a text box. In conclusion, we hope the above methods help you to add music to Google slides presentation. For any suggestions or queries, feel free to write to us in comments below.